We have a special preview of one of our most exquisite items up for auction at the October 7 ‘Faces of FACES Benefit for Cleft Lip and Palate.’ We’d like to present you with photos of hand-crafted Great Blue Heron Table, created by master craftsman, and long-time FACES supporter, Gerry Thomas. If you are interested in this gorgeous and functional work of art, but you didn’t get tickets to the event, not to worry! You may place an absentee bid on this item. The value of this piece is $3,500, but you may place an absentee bid anywhere on the spectrum you wish – higher or lower than the estimated value. 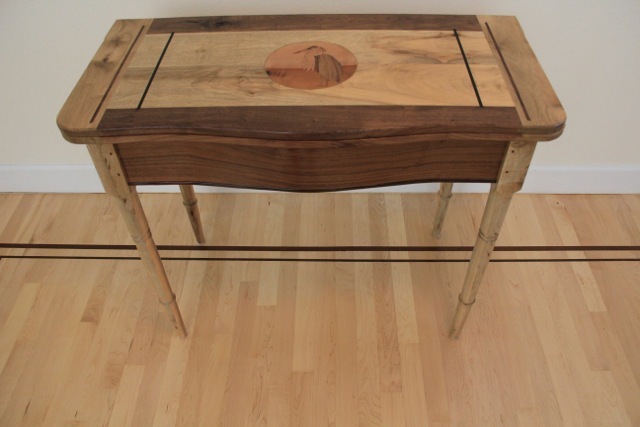 If you are interested in making on absentee bid on this amazing piece please email faces@facesfoundation.org, Subject Line: “Blue Heron Table”. For all that would like to make an absentee bid, we appreciate your support even though our event is sold out! You can donate any amount to FACES Foundation’s cleft efforts here: How to Give. Thank you! “I was raised in what was at the time a small town, Bend Oregon. One of the joys of my childhood was the many pleasurable hours I spent playing and roaming around in the woods that bordered our house. The trees, the birds and animals truly spoke to my inner being. My father was a forester and a master of a multitude of skills including woodworking. When I grew up I followed in his footsteps, and my first profession was thus in forestry. Life’s vagaries and circumstance changed things however, and along the way I assumed another profession unrelated to those pleasures I had known and loved as a boy. Still, I always harbored a desire to work with wood. I eventually was able to retire from the profession I was in and was fortunate enough to be able to journey to Scotland where I enrolled in the Thomas Chippendale School of Woodworking. The program lasted a year and enlarged on the skills I had learned from my father. My work with wood, as a consequence of my father’s influence, I consider an art form. The pieces I create I have done with love and attention to detail. I do not use wood stains because I choose not to cover the inherent beauty and patterning of the natural grains. Each piece of wood is, after all, a gift from a tree and is a reflection of the passage of time and seasons, a characterization of life. Each tells a story if one “listens” closely. So, as a sort of tribute to the wood I have used, I title each work I create. When I begin to create a new work, I often rely on the opinion of my wife, Elizabeth, as to whether an idea will be aesthetically pleasing. Her input is invaluable. The Great Blue Heron Card Table is based in part on a design originally developed by Thomas Chippendale in the 1700’s. It has a “concertina” action in opening the table. The major woods used are myrtle and walnut, but there are elements of several others including mahogany, madrone, rosewood, and ebony. The legs were turned on a lathe. The table tops are tongue and grooved as well as breadboarded to gain greater stability. The marquetry is hand cut and fitted using my own designs.